Theese are som really great pics! Great inspiration. I been followed you. Hope you can check out my site: http://theproverbs.net and follow back. Thanks and God Bless! I love all those pics! Absolutely awesome! Thank you for lovely comment, sure we can follow each other, follow you now. live in pink is the best. thanks for stopping by my blog! Just followed you :) Love your latest post. I'm obsessed with Chanel nail polish and french macarons! Nice collage. Sure we can follow each other. I will follow you now. I love the colour pink I wish I was brave enough to die my hair pink! Following you now dear! Talking about pinky, do you know pink de Victoria Secret? You have an amazing blog! great post, I really like it! Ofc I'm u new follower. Don't forget to visit my blog too! Pretty collage! love love love pink, I wish I could dye my hair that color. New follower here, hope you can stop by my blog and follow if you like. 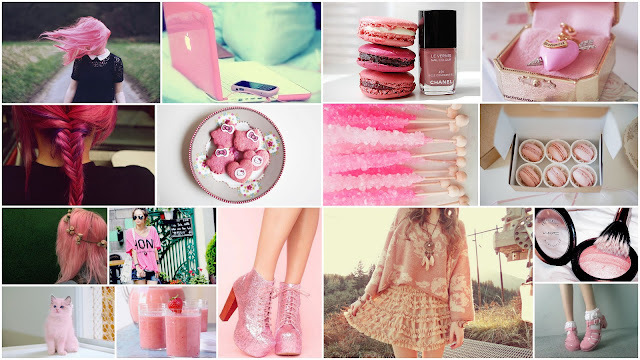 My favorite color...I'm in heaven :) Nice post! really cute pictures, lovely post.